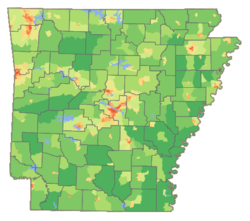 This article refers to the demographics of the U.S. state of Arkansas. Arkansas is the 32nd largest state, with a population of 2,915,918 as of the 2010 United States Census. As of 2015, Arkansas had an estimated population of 2,978,204,  which is an increase of 11,835, or 0.2%, from the prior year and an increase of 62,286, or 2.14%, since the year 2010. This includes a natural increase since the last census of 52,214 people (that is 198,800 births minus 146,586 deaths) and an increase due to net migration of 57,611 people into the state. Immigration from outside the United States resulted in a net increase of 21,947 people, and migration within the country produced a net increase of 35,664 people. It is estimated that about 48.8% is male, and 51.2% is female. From 2000 through 2006 Arkansas has had a population growth of 5.1% or 137,472. The population density of the state is 51.3 people per square mile. 2.0% from Two or More Races. 6.4% of the population was Hispanic or Latino of any race. According to the 2006–2008 American Community Survey, the ten largest ancestry groups in the state African American (15.5%), Irish (13.6%), German (12.5%), American (11.1%), English (10.3%), French (2.4%), Scotch-Irish (2.1%), Dutch (1.9%), Scottish (1.9%) and Italian (1.7%). According to the 2006–2008 American Community Survey, 93.8% of Arkansas' population (over the age of five) spoke only English at home. About 4.5% of the state's population spoke Spanish at home. About 0.7% of the state's population spoke any other Indo-European language. About 0.8% of the state's population spoke an Asian language, and 0.2% spoke other languages. ^ "Table 1. Annual Estimates of the Population for the United States, Regions, States, and Puerto Rico: April 1, 2010 to July 1, 2015". 2015 Population Estimates. United States Census Bureau, Population Division. December 26, 2015. Archived from the original ( CSV) on December 23, 2015. Retrieved December 26, 2015. ^ "Annual Estimates of the Population for the United States, Regions, States, and Puerto Rico: April 1, 2010 to July 1, 2015". 2015 Population Estimates. United States Census Bureau, Population Division. December 26, 2015. Archived from the original ( CSV) on December 23, 2015. Retrieved December 26, 2015. ^ "Arkansas QuickFacts from the US Census Bureau". ^ CDC's State System – State Comparison Report Cigarette Use (Adults) – BRFSS for 2006, lists the state as having 23.7% smokers. The national average is 20.8% according to Cigarette Smoking Among Adults --- United States, 2006 article in the CDC's Morbidity and Mortality Weekly Report. ^ "American Religious Identification Survey, 2001". Gc.cuny.edu. Archived from the original on 2011-07-09. Retrieved 2010-07-30. ^ "The Association of Religion Data Archives | Maps & Reports". Thearda.com. Retrieved 2010-07-30.